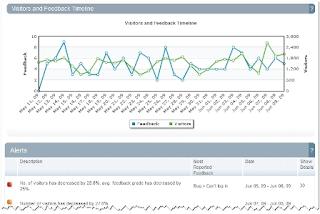 I've been a long time user of Kampyle, a solution to collect, analyze and manage your website visitors' feedback. I've talked about it several times in the past. So you might ask, what do I have to say this time? A few weeks ago Kampyle announced the integration of Google Analytics data and my friend Eran Savir, co-founder and VP of development, kindly offered the update. I waited some time to see what kind of insight I could gain from the combined results. I'm running Kampyle on the WASP site, which doesn't receive a huge level of traffic but sufficient enough to make Kampyle or worthwhile addition. Now I can see the number of feedback by visitors, which is a nice way to see how engaged are my users. But I can also see Feedback by User Loyalty as well as Feedback by Top Landing or Top Exit Pages. According to my WASP market data, the number of sites using Kampyle keeps increasing and there are other interesting features on the way: Feedback by adWords campaigns as well as behavioral targetting. Most times innovation doesn't come from ground breaking ideas, but from interesting combination of existing technologies. That's what Kampyle is doing, and doing very well! WAA Championship - have you got what it takes?